One of the best—if not the best—reasons for eating in Los Angeles’ sizable Koreatown is the opportunity to taste specialties not on standard Korean menus. 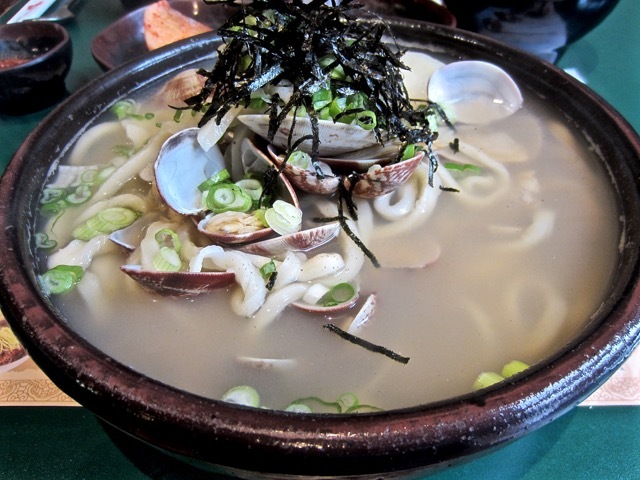 For instance, take kalgooksoo (or kalguksu), a noodle soup similar to Japanese udon with its thick wheat-based noodles in a rich broth. Hangari Bajirak Kalgooksoo specializes in it, so highly regarded that a wait to get tables is all too common. Arriving early before the noon crowd is a better way to avoid human traffic at the door. Though my wife and I got there at 11am, within a half hour, all the tables were already occupied. Instead of banchan, a sort of appetizer is served. 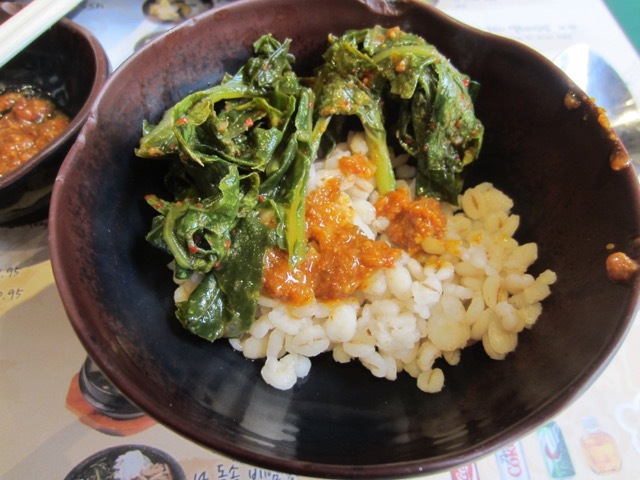 A bowl of steamed barley is accompanied by three kinds of kimchi—cabbage, daikon radish and young radish leaves (yeolmu)—as well as a gochujang miso paste (dwaenjang) that can be daubed on the barley with a little sesame oil. The soups arrived after a wait of 15-20 minutes. The bowls were quite large, holding a generous portion of noodles and broth with other ingredients. Manila clam kal guk su (☆☆☆½) easily harbored two dozen clams (bajirak) which started out perfectly cooked but not surprisingly became more rubbery as they sat in the steaming hot, delicious clam-flavored broth. Also included were slices of high-starch potatoes that were much too mealy and kabocha. More impressive was chicken kal guk su (☆☆☆☆, top image). The small half chicken shredded easily with chopsticks, obviously simmered long to make the wonderfully rich broth enhanced by aromatics and other flavorings. What make these soups a great comfort food, besides the broth, are the noodles. They are typically made from scratch with flour, kneaded and hand-cut with a knife, giving them a superb doughy, springy texture. Hangari delivers in spades. No, the title of this post is not a subject line but the actual name of the restaurant that serves seolleongtang, or ox-tail soup. It’s an indication that the Korean dining scene, at least in Federal Way (and Lynnwood), has matured to the point where a restaurant can specialize in one or two things. K-Town in Los Angeles especially comes to mind. Located across the street from H-Mart, Traditional Korean Beef Soup (henceforth, TKBS) is tucked away in a strip mall, difficult to spot as you’re driving along divided Pacific Highway South, difficult to get to if you’re pointed in the wrong direction (south) on the other side of the divider. We had to make a U-turn at S 320th and, having failed to spot the restaurant the first time, go around the block, until we spotted the storefront. As soon as we entered, a comforting savory aroma greeted us. Every table already had a menu, a roll of paper towels and an earthenware jar filled with coarse salt. The lone waitress there hardly spoke English, so there was much menu pointing to convey our choices. There are four choices of seolleongtang: beef brisket, tongue, mixed (cartilage, tendon and tripe) and cartilage & tendon. You also have the choice between white or clear noodles. Our beef brisket soup came bubbling in a dolsot (stone bowl), looking for all the world like Japanese okayu with a similar milky liquid. One sip of the broth was also like okayu—namely, very bland—which is exactly what I expected from reading the reviews. Instead of rice providing the milkiness, seolleongtang’s comes from simmering ox leg bones for many hours. Whether TKBS actually uses ox bones (or beef bones instead), I can’t say. I only wonder because oxen are not very common in the U. S.
The idea is for the diner to season the soup according to taste. Coarse salt from the jar is the beginning. Black pepper can also be added. Served simultaneously as the soup are a bowl of sliced green onions, kochujang paste and baechu (nappa cabbage) and kkakdugi (daikon) kimchis. Any and all of these can be stirred into the soup, not to mention the purple or white rice that comes with the meal. By the time I was done adding, mine had a bright orange-red color. Slices of brisket were very tender. After all that, the soup was less bland, spicier, saltier (☆☆½). It’s one of those food items that one likely appreciates more after having grown up with it. I must say though that TKBS’ kkakdugi (☆☆☆☆) is the tastiest we’ve ever had, a standard now against which to compare others. For all the restaurants that Ballard boasts having, none has been Korean. Until now, that is. What used to be a sushi restaurant on 24th Avenue only a few weeks ago is now Kimchi House. There was no change in ownership, just a change in the chef and menu. After the father retired, the rest of the family decided it was time to introduce the neighborhood to Korean food. The interior is very small, like the menu, displayed on what looks like two LCD monitors suspended above the counter. You order what you want and take a seat. The food will be served to you. Though the menu will expand in the coming weeks, what’s offered now is confined to bulgogi, kalbi, bibimbop, pretty much standard Korean fare. But then, there is the house sandwich with your choice of pork belly, beef or tofu; kimchi fries, made with kimchi, cheddar, sour cream and house sauce; and kimchi fried rice. I’m assuming that, like today, there will be specials posted on a whiteboard on the counter. Another difference from standard Korean restaurants is that banchan (☆☆☆½) is served on a plate with your order, side dishes American-style. Today’s consisted of red potatoes simmered in a sweet sauce (gamja jorim), shredded radish kimchi and what the restaurant calls white kimchi, pickled napa cabbage, similar to what Japanese call hakusai no shiozuke. This was so good, gingery and sour that I had to purchase a tub of it, which with other condiments, is available for purchase in a refrigerator up front. The potatoes were excellent. Pork belly is Kimchi House’s specialty, which meant I was going to go for it. There were nice grill marks on the marinated belly pieces. Tasted by itself, it was good (☆☆☆), equally so when dipped in the sweet kochujang sauce available in a squeeze bottle at every table. My wife’s mushroom soon dubu (☆☆☆), a special of the day, was also good. Though the tofu pieces were rather small, the broth was better than most with mushroom and shrimp shell flavors. Slices of shiitake, onions, green onions and shrimp rounded out the ingredients. With food this well prepared, Kimchi House should have no problems getting locals to make Korean food a part of their regular restaurant rotation. I enjoy chiropractic adjustments not only because I feel better afterward but because my chiropractor is a good friend and fellow foodie. At our sessions, my wife and I wind up talking to him more about food than our spinal health. So, it was with great surprise and excitement that today we were given the highest endorsement for Southgate Garden Restaurant, only blocks away. Ever since taking over the Denny’s spot in Bellevue, Southgate had been a mediocre restaurant, not bad but not great either. Recently, there had been an ownership change though the name remained the same. As I understand it, the folks who prepared banchan at the back corner of Paldo Market, now closed, took over. Our chiropractor told us that a few of his Korean patients gave their recommendation. He is now a regular customer. Could there be a challenger to Seoul Hotpot, our favorite on the Eastside? We immediately went there after our adjustments to find out. The first thing we noticed was that the parking lot was full, even at lunchtime. This was very rare before. When we walked in, there were no obvious physical changes to the layout or decor, basically the same as before. But most of the tables were occupied, consistent with the parking situation outside. We were seated in one of the remaining free booths. There is a lunch menu, a welcome change from the “old” Southgate, consisting of a variety of bibimbop (rice bowls with savory toppings), soups, stews and soon dubu (soft tofu stews). The barbecued items are reserved only for dinner. We also noticed on the dinner menu eun dae goo jorim, an incredibly tasty braised black cod dish that we enjoyed with friends at a Korean restaurant in Lynnwood. The meal started off well with very tasty banchan (☆☆☆), six of them in total. Exceptional were the potato salad with corn, cucumber and surimi; pajeon (pancakes with green onions); and kongnamul (bean sprouts with sesame oil). One in particular we’d never had, a square of what looked like a slightly yellowish soft tofu but combined with egg, yielding a custardy appetizer. Usually preferring spicy dishes, I chose a beef and egg soup (yook gae jang). In the soup were shredded beef brisket, egg, green onions, bean sprouts, taro stems (torandae) and sweet potato noodles, all arriving at the table bubbling hot in an iron pot. It was so hot, in fact, I burned my tongue on the first sip. This was a delicious soup (☆☆☆½), at once spicy and savory, and substantial enough (especially when I mixed in my white rice) to satisfy an empty stomach. My wife chose one of the soft tofu soups, Spicy Soft Tofu with Egg and Vegetables, dialed down in spiciness per her request. The broth was relatively clear and tasty. The soup was chockfull of tofu, three kinds of mushroom (enoki, white and oyster) and topped with a raw egg by the waitress at the table. Like my soup above, the soup came to the table bubbling hot, also in an iron vessel. With the reinvention of Southgate, the Eastside Korean restaurant scene has dramatically turned for the better, a wonderful development for us because it is much closer to home than Seoul Hotpot. 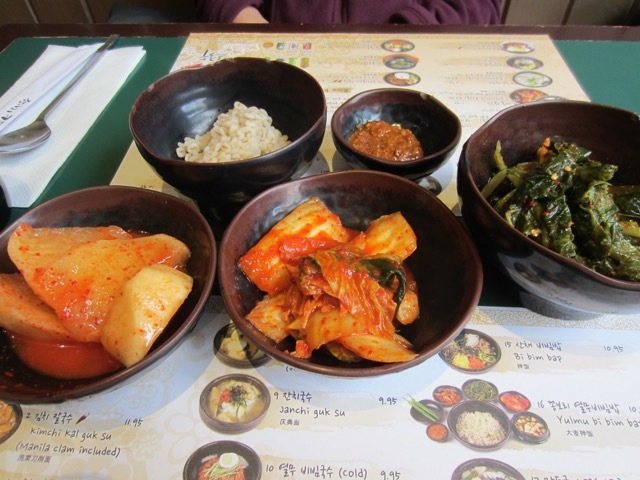 In fact, if other dishes turn out as well as those we had today, we might make it our go-to Korean restaurant. Update 10-8-13: We returned here with friends to celebrate a birthday. Here’s what we ordered: japchae, seafood pajeon and braised block cod (eun dae goo jorim). The yam noodles (japchae) were adequate (☆☆). The vegetables were cut rather large (cabbage, carrots, napa) and the flavors of sesame oil and soy sauce were faint. This was a surprisingly bland version compared to others we’ve had. The seafood pancake (haemul pajeon), on the other hand, was praiseworthy (☆☆☆), generous amounts of squid, octopus and green onions in a thick “omelet” made of egg and rice and wheat flours. The pancake was accompanied by a dipping sauce (soy sauce, garlic, green onions, rice vinegar and sesame oil). The best dish was the braised cod (☆☆☆½), served bubbling hot in a stone casserole. Several pieces of sablefish steaks were combined with tofu, rice pasta and white radish, braised in a thick, briny gochujang broth, and topped with sliced green and red bell peppers, cooked egg strips and enoki mushrooms. Mildly spicy, it is one of those dishes that satisfies with its boldness and, to the newly initiated, surprising ingredients. The radish in particular, doing a good imitation of turnip, was soft and flavorful. At current market prices for black cod, it is also an expensive dish ($32.95), roughly the going price at any Korean restaurant that serves it. Update 10-19-13: Three of us had lunch here. Besides the beef and egg soup (yook gae jang, see above), we also ordered the Bibimbop with Bulgogi in a Sizzling Stone Pot (bulgogi dolsot), a very good dish (☆☆☆½) with generous servings of namul (shiitake, bean sprouts, shredded carrots, zucchini), a fried egg (rather than a raw one) and shredded, toasted seaweed. And the bonus, of course, is the crusty layer of sesame oil-flavored toasted rice on the bottom of the bowl which can be scraped off and eaten. There was little fault to be found with this bibimbop. A good review in the Seattle Times early this year was enough for three of us to drop in on Kalbi Grill Express for lunch in the Greenwood neighborhood. Could we get good Korean food closer to Seattle than Lynnwood? We were surprised that we were the only lunchtime patrons until a lone customer came in later. Although its name suggests an emphasis on Korean BBQ, the menu said otherwise. Two of us decided on beef soon dubu, another on beef bibimbop, which the Times praised. Let’s start off with the banchan, the appetizers that every Korean restaurant serves. No other cuisine that I can think of pays this much attention to making little side dishes to accompany a meal, doubtless taking time and effort to make. I’ve often only wanted banchan and rice. Which leads up to Kalbi Grill’s unorthodox approach to offering it, namely, with certain dishes you select only three appetizers, all displayed behind a glass counter, per individual order. Oddly, the bibimbop didn’t qualify. For variety, the obvious strategy was for the rest of us to pick three different ones. Whether these were refillable as at any Korean restaurant, we never determined, though there was no reason to suspect otherwise. The beef soon dubu (☆☆½) was adequate, though the broth was overly salty and lacked the depth of flavor I enjoy at Seoul Hot Pot. The beef was cut into little pieces, more tender than I would have expected in a stew that arrived at the table bubbling (literally) hot. Also in the broth were zucchini, enoki and regular mushrooms and green onions. The silken tofu, rather than cut into chunks, were cylindrical in shape, as if cut with a tube. In summary, the stew was adequate but not likely to make me forget Seoul Hot Pot’s. An oversight when we received the bibimbop (☆☆) was not having been provided with the kochuchang sauce. We had to ask for it, whereupon the owner apologized and agreed that bibimbop would not be bibimbop without it. Innocent enough mistake. But, even when served with beef, zucchini, bean sprouts, spinach, shredded carrots, cucumber, eggplant, shiitake mushrooms and an over-easy egg, the rice bowl failed to generate much excitement, bland and inadequately seasoned. Adding sauce did little to liven up flavor. What’s more, as reported in the Times review, rather than being served in an earthenware bowl that when heated up characteristically crusts up the rice at the bottom, it was some sort of heavy plastic material (which would never be subjected to high heat), making us wonder whether the reviewer and we ordered the same thing, or if the management has cut corners. We’re not likely to return. For now, our favorite Korean restaurant reasonably close to home remains Seoul Hot Pot in Redmond. There has been a lot of buzz lately about Red Lantern, a Chinese restaurant that also serves some Korean dishes, located along the edge of the International District. Unlike most restaurants in the area, the prices are on the high side and the ambience more upscale than one typically finds in the ID. In 2011, Seattle Met magazine considered it one of the best Chinese restaurants in Seattle. Korean dishes in a Chinese restaurant are not all that unusual. There were many Chinese who immigrated to northern Korea and developed a unique cuisine, from which came two of the most popular dishes, jiajiangmyun and jahm bong noodles, both of which are tellingly on the menu at Red Lantern. We decided to have dinner here before attending a talk at Benaroya Hall by Julie Otsuka who discussed her novel about Japanese picture brides (Buddha in the Attic). Though it was cloyingly sweet, Basil Lime Shrimp was the best entrée. The shrimp, battered in cornstarch, was perfectly cooked and served piping hot. The sauce was overly thick from a combination of cornstarch and too much sugar, with lime so sparingly added that more would have gone a long way toward balancing the flavors. As it was, citrus was barely detectable. Also stingily added were basil leaves. Curiously named is Mao’s String Bean, which was neither revolutionary nor made with string beans. Instead, Chinese long beans were cut into less than 1/4-inch pieces, stir-fried with ground chicken and a dark soy-based sauce, a dish that sounded more interesting than the execution. Even so, it wasn’t bad. The dud was Salt and Pepper Pork Chops that lacked much flavor. The chops were sliced, battered and fried, but the flavor was dull and uninspired with not enough salt and pepper to justify its moniker. To make matters worse, some of the pieces were gristly and had bones in them, a not-uncommon Asian culinary practice, but surprising when hidden behind batter. Maybe there are dishes at which Red Lantern excels. But based on three that were randomly chosen, it’s hard to understand how and why the restaurant has garnered the praise that it has. It’s not a bad restaurant, just not great as the reviews would have you believe. The first time I had soon dubu jjigae was in Santa Clara in 2002. My daughter’s roommate, when they were living in the San Jose area at the time, took us to So Gong Dong Tofu House. I recall what a revelation it was, a savory and spicy stew featuring soft dubu (tofu). Since then, I’ve had it many times, both in California and Washington, in various forms. This is one of those dishes that really satisfies when the weather gets cold. On the Eastside, the pickings of Korean restaurants are pretty slim. With the closure of Paldo Market (and therefore the Korean restaurant inside its doors), the choices got slimmer. Luckily, Seoul Hot Pot in Redmond has been around for a few years. More than that, the food here is pretty good. Daily specials written on sheets of paper are pasted on the walls.